This delightful new book Cookery a la Carte, issued in a limited edition by the Choir Press, is a collection of recipes provided by members of the D'Oyly Carte Opera Company over the years. Based on a collection started by a former chorus member, the selection of recipes has been expanded and edited by David Steadman and Melvyn Tarran too over 100 entries. But the book is much more than a recipe book. Presented very much as a scrap book with a page or two devoted to each person, there are biographical sketches, anecdotes and pictures (many of them historic) in addition to the recipes. You are warned that many of the older recipes have not been tested, and many are provided in facsimile of the original hand-written ones, which can make something of a challenge when trying to read them. 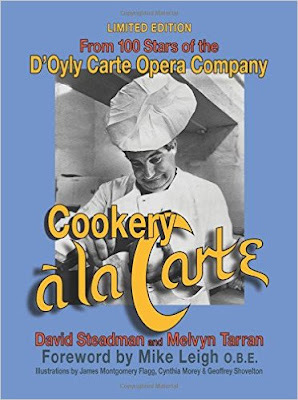 The book started out as a collection presented to D'Oyly Carte chorus member Joy Garland when she left to get married, a collection which she continued expand and this has been further expanded by the editors David Steadman and Melvyn Tarran into the present volume. The list of contributors is impressive, with many historical figures making an appearance in addition to those who would be familiar to attendees of D'Oyly Carte productions in the later 20th century. The selection starts, of course, with Gilbert and Sullivan including memory of life at Gilbert's Grimsdyke house by the daughter of his under cook, and recipes from Sullivan's Belgian kitchen maid. After these historical reminiscences, the book then is divided into sections by theme, Cocktails, Fish, Pasta, Meat, Vegetarian, Carte's Tartes & Desserts, Cakes Treats & Picnics, Sunday Bunch. But browsing the recipes is tricky, partly because many are hand written and require decipherment, and partly because there are so many photographs and articles to read. If a recipe catches your eye, you are easily diverted into reading the biographical details of the contributor or admiring the rather alarming photographs of them in costume! With such collections, it is always fascinating looking up people with whose work you are familiar, and in my case I enjoyed finding out that Valerie Masterton contributes Barbecued Spare Ribs, John Reed contributes Sponge Cake with home-made Lemon Curd filling, Marilyn Hill Smith contributes Chicken a la Carte and Donald Adams contributes Cheese 'n' Onion Pie. Even if you are not interested in cooking, the book makes a delightful peruse as the recipes provide an interesting personal slant complemented by the many pictures and anecdotes.